Berry requests details about a celebration in honor of Adolph Ochs. She plans to be in Chattanooga at the time and things that Ochs is one of the greatest men in the country. 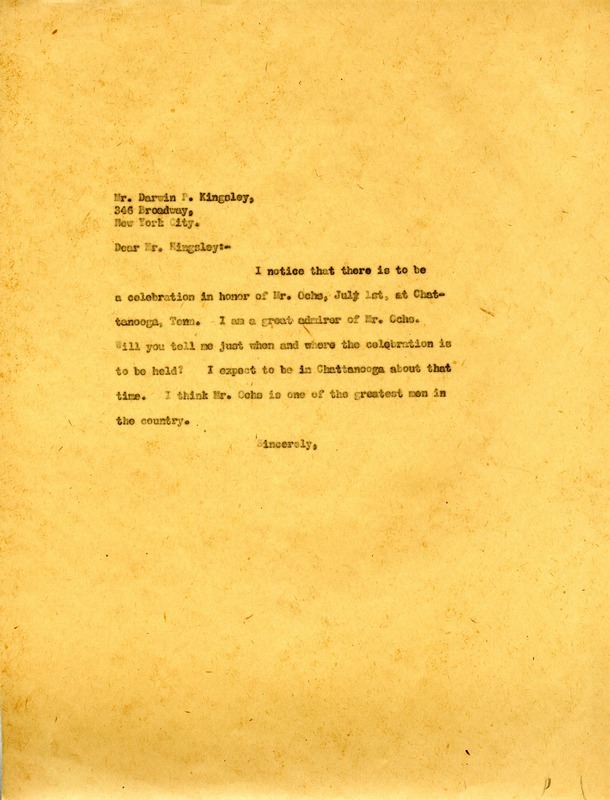 Miss Martha Berry, “Letter to Darwin P. Kingsley from Martha Berry.” Martha Berry Digital Archive. Eds. Schlitz, Stephanie A., Rachel Renaud, Sherre Harrington, et al. Mount Berry: Berry College, 2012. accessed April 22, 2019, https://mbda.berry.edu/items/show/8153.